You’ve decided to make the next step and join the Sea-Doo Family. It’s a big moment, to be ready for so much more adventure in the water, and to know that the Sea-Doo watercraft you choose will be creating memories for yourself, friends and family that will last. Before heading to the dealer, it’s a good idea to have a few things in mind so that you can be sure that, with so many options, you’re able to choose the right one for you! The Sea-Doo site has a pretty great tool called Find Your Sea-Doo. It makes a suggestion based on the preferences you select. Playful – the rider that wants to go out, have loads of fun on a nimble craft and get a little wet while they’re at it. Aggressive – this rider prefers to take on the waves at full speed with all of the power, performance, and technology available. Relaxed – And, there are those who just want to cruise. This rider’s looking for luxury while they set their sights on new destinations and take in the waterways. 2. Seating – In this section, you’ll choose between one to three seats. Generally, one-seaters are lighter and more nimble than three-seaters. And, if you’re planning to use your watercraft for towing, law requires three seats for the operator, spotter, and person being towed. 3. Riding Time – This takes into account each session on your watercraft which can be a challenge to decide on if you’re a first time owner. A good way to figure this out is to base your riding time on the amount of time that you will have available to spend on the water. After work? All day on the weekends? These basic questions will give good guidance. 4. Water Type – This preference combined with your riding style, will help suggest: the size of watercraft you may need along with whether you should get suspension. 5. Speed – Here, you’ll be telling the tool if you’re happy at a nice steady pace, or if you speed is a necessity in your life. This will better suggest the size engine for your riding style. 6. Comfort – Used along with the other categories, this will help to suggest a ride that has the right amount of stability and technology for your needs. 7. Maneuvering & Handling – Ease of handling your watercraft will be important. And, this will help determine the amount of control you need depending on whether you want to take tight turns on a dime, stop quickly, or dock in a matter of seconds with iBR technology. 8. Tow Sports – This preference is as straightforward as it sounds and the selection will help match you with a watercraft that gives the support you need for tow sports. Ready to have your go, and Find Your Sea-Doo? Check out the tool here, and let us know in the comments if it lines up with what you had in mind for your dream Sea-Doo watercraft. The Sea-Doo Speed Tie makes docking simple and fast with two eight-foot long retractable cords that can be locked at any length from 1″ to 8′. 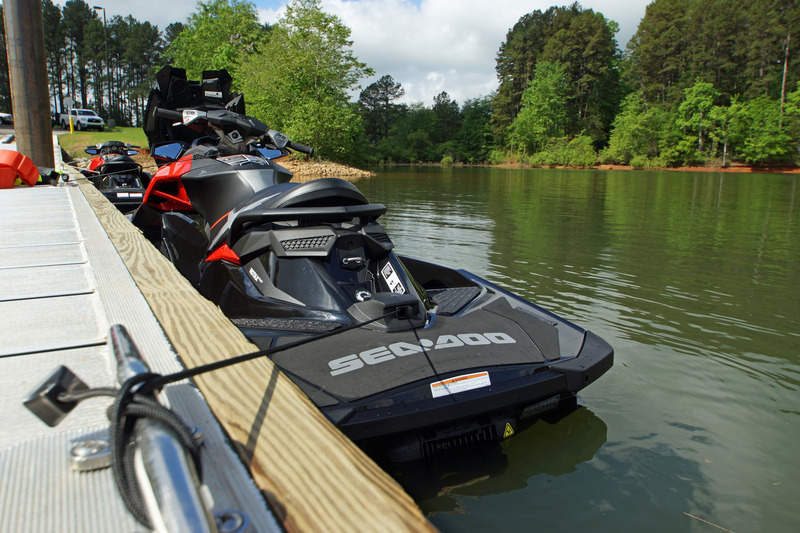 The Speed Tie is designed to be completely intreated to the back deck and port side helm area of all 2011 Sea-Doo models and beyond. This is the answer to wet ropes onto of your wallet, cell phone, or t-shirt and frees storage space for other items. For more information on the Sea-Doo Speed Tie and Dock mounted Speed Tie system visit the on-line Sea-Doo Store. baldwin, best, bushell, buy, champ, champion, city, clayton, dealer, dealership, easy, farthing, fast, fastest, finish, Florida, fun, handling, hawkins, hull, IJSBA, interview, jet ski, jetski, monster, panama, personal watercraft, power, pwc, race, racing, reliable, rip, Sea-Doo, seadoo, snyder, t3, today, tour, win, x-team. BRP is proud to support the only on-line radio show dedicated to the sport and activities of personal watercraft, Liquid Speed Radio. Tuesday, May 30th features Sea-Doo X-TEAM rider and Test Ride Tour manager Cody Hawkins who will offer insight to this year’s Sea-Doo effort on the track and at neighborhood lakes and waterways. The Liquid Speed radio show will begin airing LIVE at 7:30 p.m. CST on www.liquidspeedradio.com. The first hour is the Sea-Doo X-TEAM Hour dedicated to Sea-Doo competition, racing, and recreational events. Host Brian Smith leads the topics and interviews the biggest names in personal watercraft racing and free riding. May 30th’s show will include Hawkins and multi National Champion, and Mountain Motorsports of Atlanta, Georgia General Manager, Dustin Farthing. At 8:10pm CST Dave Knisley joins join the show to talk about this weekends upcoming UWP/IJSBA National Tour kickoff race in Lake Charles, Louisiana. Smith and Knisley will talk about what’s new with the tour in 2013 and who to watch, including Pro Stock contender, Troy Snyder on his RIVA Sea-Doo RXP-X and Pro Open World Champion James Bushell on his 158 Performance RXP-X. At 9:10pm CST Liquid Speed will welcome Farthing to Liquid Speed Show and will discuss if he will race the tour full time this season, Or will he race overseas? What’s the next at his Mountain Motorsports dealership? Listen in to find out!! BRP Sea-Doo X-TEAM racer, James Bushell of the UK continued to build upon his legacy and that of the Sea-Doo RXP-X watercraft by repeating as Pro GP and Pro Open World Champion at the recent 2012 IJSBA World Finals. Bushell’s Championship success on the T3 hull design at the 2011 event was magnified at the 2012 event as starting lines were filled with black and yellow Sea-Doo RXP-X models. Sea-Doo PWC riders won 16 of the available 21 titles and filled 47 of the 63 available podium positions at the 2012 World Finals. Bushell’s performance in both the Pro GP and Pro Open class were easily the most dominating performances in recent history, further building the new racing legacy of BRP’s Sea-Doo RXP-X watercraft. Bushell’s precision on the race track was astounding but equally as impressive was the two additional podium finishers riding Sea-Doo RXP-X models in Pro Open; Jared Moore of South Africa finishing second and third place finisher Chokuthit Molee of Thailand. Sea-Doo Centre backed RXP-X rider Kylie Elmers of Australia also added to her collection of World titles by nearly lapping the field on the way to the 2012 Pro Women Championship. All of these champions were assisted by the tuning skills of Les Cooke of the Sea-Doo Centre in Australia who has mastered the ability to expand on BRP’s Sea-Doo RXP-X out of the box racing capabilities to put these riders ahead of all other challengers. “BRP remains a trendsetter and continues to maintain its status as the industry leader in performance”, added Chris Dawson, vice-president and general manager, International division. “This result shows that Sea-Doo personal watercraft popularity is truly global”. The 2013 Sea-Doo RXP-X watercraft will start being available in BRP dealerships October 2013. For a more detailed look at the new T3 hull, Ergolock system and stunning flowing facet design, visit www.sea-doo.com. 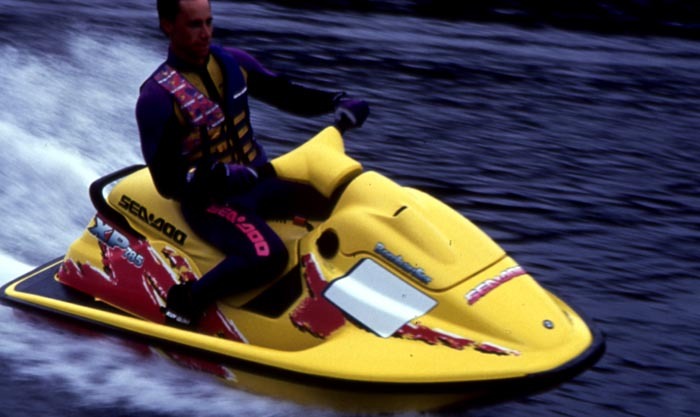 The Sea-Doo brand was embracing the watercraft industry leadership position in 1995 and product development was progressing at an astounding pace. Two new Rotax marine engine platforms were introduced in 1995, the 717 twin-cylinder and the 787 RAVE (Rotax adjusting variable exhaust) engine. The 717 engine was nestled into the new Sea-Doo XP hull code named the X4 hull that spawned from learnings from the companies race teams. This hull’s design included a nose section dropped down and extended the transom with interchangeable trim tabs for greater surface area touching the water for better handling than the previous version hull. 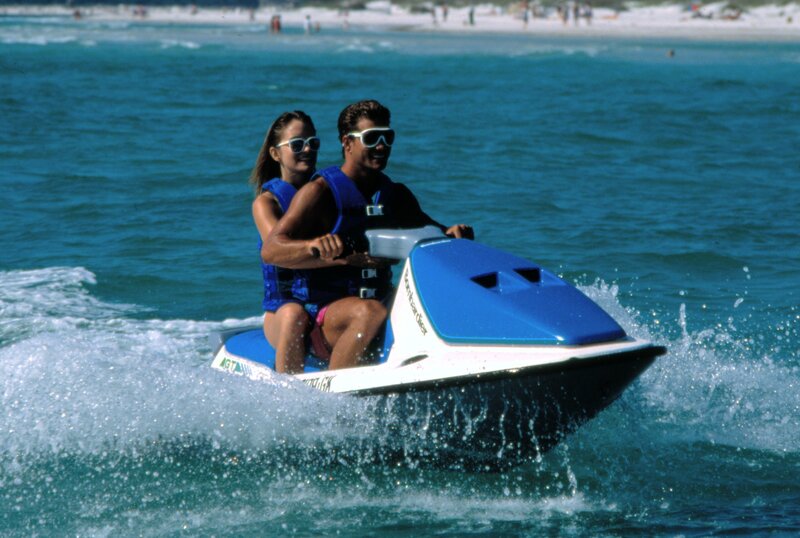 The headliner of the 1995 line was the new Sea-Doo HX watercraft. The Sea-Doo HX featured a very aggressively designed hull with extreme keel angles and ultra narrow running surface for slicing through chop and a pronounced inward angled gunnel chines to allow the machine to lean into turns similar to a motorcycle with the industry’s first production suspension seat that compressed with the g-forces of a turn to lower the rider’s center of gravity and absorb shock in straight line chop. The Sea-Doo HX was inspired by the dolphin and the design characteristics can be seen in the shape of the HX. The 1995 Sea-Doo HX was the first watercraft to win the prestigious NMMA IMTEC award (now the NMMA Innovation Award). Bombardier also released a monumental watercraft called the Sea-Doo XP 785, a limited edition performance model featuring the new 787 “slant” engine featuring the RAVE system perfected in Ski-Doo snowmobiles to change exhaust timing to maximize low end torque and top end RPM. This would be a historical model introduction that would go on to be the winningest racing runabout watercraft model of all time. Watercraft racing would be close to its all-time peak in popularity and the biggest names in the sport were now competing in the Pro Runabout class with the Sea-Doo X-TEAM led by the sport’s most popular rider, ‘the flyin fish’ Chris Fischetti. The Sea-Doo brand was also growing its involvement with the Pro Wakeboard tour as wakeboarding was quickly overtaking traditional skiing as the most popular tow sport. Enthusiasts began to realize they could be pulled by the Sea-Doo GT model watercraft making wakeboarding easier, less expensive, and more accessible to more people. Innovation in the three-seater category continued to grow that segment with the Sea-Doo GTX receiving a power upgrade in 1995 with the addition of the 657 Rotax engine and first ever touring seat option for a plusher ride. 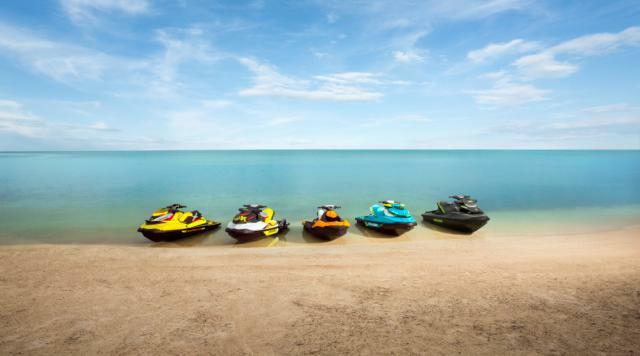 Personal watercraft was the hottest recreational product in the industry and the Sea-Doo dealer network could not get enough product to fill demand. Bombardier also became very proactive in the areas of social responsibility and boater education with the “Boat Smart From the Start” campaign. To gain public attention boating safety and responsible watercraft operation the Sea-Doo brand was partnered with the world’s most popular TV show of the time, and a show that’s theme was water safety, Baywatch. Many of the actors made public appearances at boating events promoting safe boating practices as well as lending their time for Public Service Announcements for proper watercraft use and wearing Personal Floatation Devices (PFD).